Embrace Black — We Are BEST. 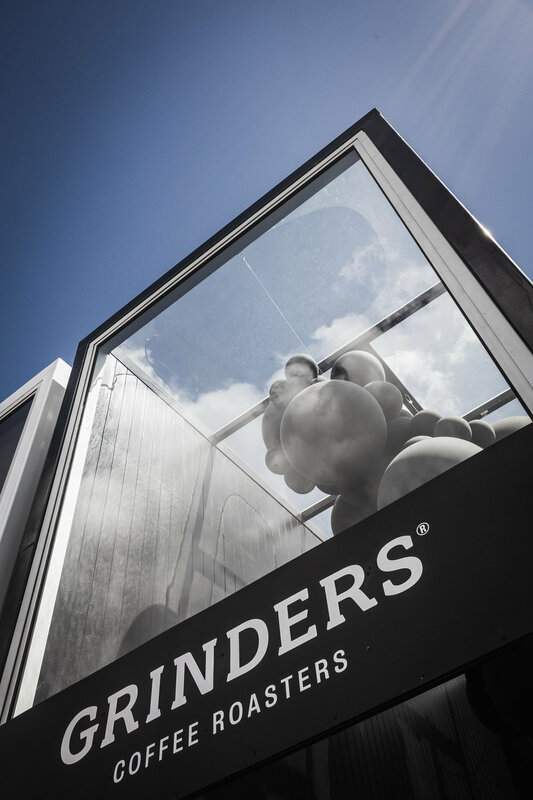 The first instalment of Grinders Coffee strategic brand undertaking for the upcoming year was launched at the 2018 Melbourne Cup Carnival as the start of a three-year exclusive coffee partnership between Grinders Coffee Roasters (GrInders) and Victorian Racing Club (VRC). BEST. Creative Director Jacob Burke and Design Manager Tom Debenham worked to design and project manage the build of the pavilion and activation spaces for the exclusive Birdcage Enclosure and The Park – Flemington’s food, fashion and entertainment precinct. The 'Embrace Black' design draws on the strategic and creative themes for the above the line campaign in development to be launched in early 2019 called 'From the Street's of Melbourne'; the home of Grinders Coffee. The Birdcage enclosure featured a 6x4 meter pavilion constructed with Spacecubes. The versatile product allowed for a stunning configuration and the perfect framework for the bold interior design - the interior finishes achieving a beautiful, luxurious outcome. 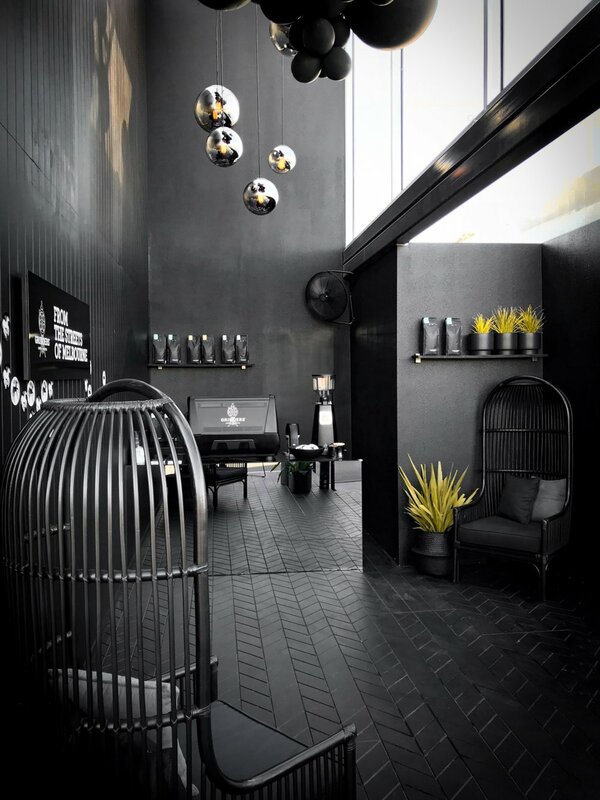 Encased in the ceiling a curated display of lighting and balloon installation hovered over the black chevron floor and the walls painted black V-groove both complimented by a black mirrored coffee counter. All of this being put to good use for racegoers with coffee served by Grinders Baristas and former World Latte Artist Champion Caleb Cha. 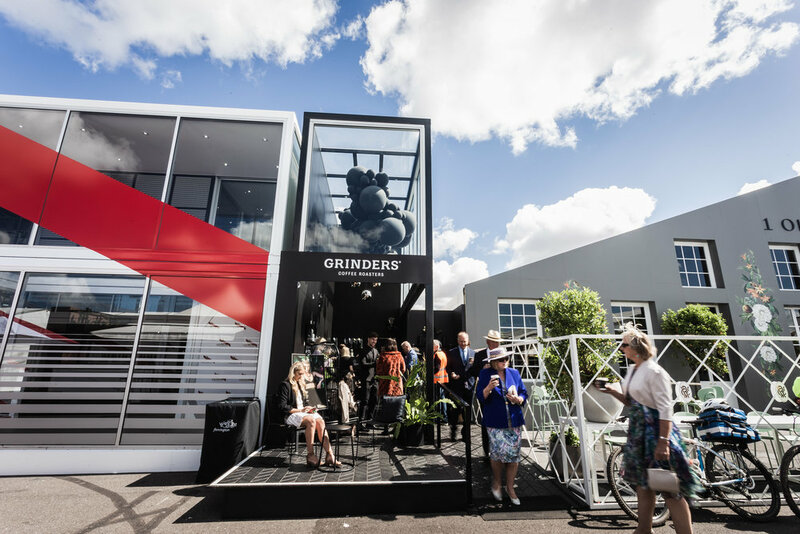 Meanwhile, in The Park, Grinders served a delicious range of premium coffees from the Grinders ‘Short Black’ Caravan, a piccolo-sized caravan with matte black styling featured in the relaxed park cocktail themed area. Local artist Antra Švarcs designed a number of stickers to activate and transform the Grinders Birdcage space throughout the carnival, with guests being given bespoke stickers featuring Švarcs’ designs to stick onto the walls to create a unique art installation. The Grinders race day ambassadors, dressed by Melbourne fashion house NIQUE, dripped in handmade jewellery by Melbourne jewellery designer Megan Moss. Both Megan and Antra are two emerging Melbourne talent who featured in the new 30-sec brand campaign, launched on Cup Day and will be a key part of the 2019 campaign rollout, alongside Melbourne singer-songwriter Janeva, whose track 'You and I' is the track for the campaign.